Aussies really do live in the lucky country, with our enviable summer seasons where we indulge in long days, barbeques and cricket on the beach. However, as we have all experienced, it also brings with it an unbearable amount of heat. In fact, this summer Australians’ experienced extreme temperatures, with temperatures set to soar above 40 degrees in some parts of Australia this summer. With these high temperatures – many of us rely on the trusty air conditioner to cool us down, usually resulting in soaring electricity bills to match the outside scorching heat! Luckily – we have found some alternative, and inexpensive, methods on how to stay cool in Summer without air conditioning. One of the first things you logically do when it starts to heat up is to open the windows and catch a breeze. While this does help, the hot air outside is generally the same temperature when it comes inside. To help cool the air down a little bit, try placing a damp sheet over the window. The cold water will cool the air, providing you with a cooler breeze. Instead of just sitting next to a fan blowing hot air, try turning it into a little homemade air conditioner. Place a bowl of ice or frozen water bottles in front of the fan to cool the air down. This sounds obvious, but it is amazing how staying hydrated with a freezing glass of water or other cool beverage helps to cool your body’s core temperature. You can even get creative by mixing up your own fruit juice recipes, freeze berries and refreshing herbs in ice cube trays to include in your beverages. Many public locations such as libraries are air-conditioned, offering a nice place to cool off for free. Or if reading is not your thing – consider heading to the local shopping centre and enjoy window shopping in the nice, cool air. Cinemas and local museums are also usually air-conditioned and can be enjoyed at a minimal price whilst entertaining the family at the same time. Turning on an oven is essentially the equivalent of using a heater inside your home. Instead, avoid using heat, or use very low amounts of it when preparing meals. There are plenty of meals that require no cooking at all, such as salads, sandwiches and smoothies. Appliances offer a great alternative to the oven. Rice cookers and microwaves put out very little heat, as do crockpots. Of course, the Aussie BBQ is always a great summer tradition that keeps the heat outside from the house. Taking a cold shower is just like jumping into a cold pool. It will cool you down and leave you feeling great for an hour or so. 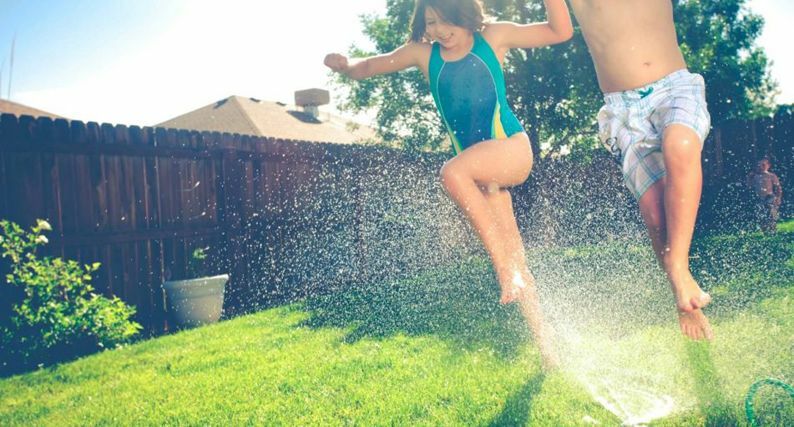 For the kids, taking cold showers might prove to be a difficult task, so consider getting a backyard sprinkler to attach to your hose for them to play under. You could also place your feet into a bucket of cold water to cool you down. Or wet an old t-shirt and wear it whilst sitting in the shade. Trying to sleep in the heat is uncomfortable and frustrating. To cool you and the bed down try sticking your sheets in a bag and sticking them in the freezer. After they are sufficiently cold, take them out, make the bed and lie down. The same thing can be done with pillowcases and clothes for a nice chill. Kiddie pools are not just for kids when it comes to keeping cool whilst having fun, although remember that it is vital to supervise all children when they’re playing in or around water. Try filling one with ice and water and getting in, yourself. Not all dogs love the water, but if they will brave it – Kiddie pools are also a great way to your best mate cool as well.